Last week in New York City hundreds of members of the International Association for Music Libraries (IAML) and international Musicological Society (IMS) gathered for a week’s worth of presentations, meetings, and discussion to consider “Music Research in the Digital Age” (our previous coverage HERE). It's a statement of fact, of course: these days whose work is not somehow inflected by new digital media, and new ways of interacting with them? And whose interactions with colleagues has not been made more rapid and frequent by the advent of the digital domain? —were framed by plenary sessions that sought to get everyone thinking in a more intentional way about where we've been, and where we might be in another decade, both here and abroad. Collections. In the last decades we’ve watched the explosive growth of new kinds of digital resources: sound and image archives, facsimiles of print and manuscripts editions, digital encodings of musical notation and other information, and new modes of scholarly communication in blogs, multimedia journals, and beyond. How do we make sure that these resources are visible and discoverable? How is ubiquitous access to materials manifest in current work, and what kinds of research questions are scholars asking? What questions might they ask next? How are new modes of publication changing the material aspect of our work? Collaborations. Musicologists are working together in new ways. We’re also working more than ever with library and IT specialists, and with a widerning range of scholars from other disciplines (not just literary and historical studies, but the social and hard sciences as well). How have digital technologies in particular encouraged such collaboration? How might participation in multi-authored publications or projects change the character of our work? What possibilities seem especially ripe for international collaboration? What barriers are there to such work, and how could the AMS and IMS/IAML work to reduce them? How are state (private) funding bodies likely to view such work? How sustainable is any of this? Communities. What good is our work in the world at large? Who has access to it (here I am thinking of the open-access and open-source movement)? In the age of Wikipedia, who will bother to look at current musicological publications? How do we communicate with peers in other disciplines, with professional and amateur musicians, and with the public at large? 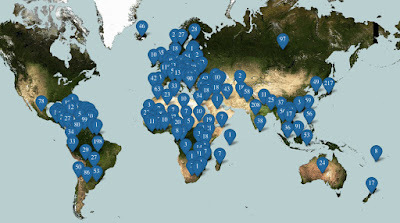 How can digital modes of publication help us reach such folks? And what of the next generation of students and scholars? How is the teaching of musicology and the formation of musicologists changing? How are North American graduate programs changing? Sisman related her own tale of digital discovery, which began with an attempt to put Haydn’s earliest Esterhazy contract—and his earliest symphonies—into their original time and place. The results took her sent her skipping through star maps and other observational aids, eventually returning to illuminate Haydn’s music, no less than the circumstances of his employment. Reynolds (with UC Davis music specialist Michael Colby, immediate past president of the Music Library Association) told the story of how a chance flea-market encounter with sheet music published by women went from hobby to database. (The Christopher A. Reynolds Collection of Women's Song, 1850 -1950 is now part of Special Collections at Davis; permalink to database HERE). Colby told the parallel story of how this valuable collection found a home, and is becoming visible, thanks to innovative approaches to the cataloging and electronic publication of meta-data. Together they helped reflect on important issues of curation, sustainability, and publication. New technologies of writing have always complicated the relationship between authors and readers. This is especially true of the performing art of music. From the beginnings of western musical notation, to the advent of the printing press, to sound recording, and now to the digital domain, new technologies of transcription brought about means for controlling the effects and purposes of music, even inaugurating a new sense of it as intellectual property. Each was a "new medium" of its day, and each brought with it new ways for composers, performers, and listeners to interact around musical ideas. Now it is transforming scholarship, too. Now music scholars and scholarship are also being drawn into the process of technological change: we once viewed print (books, journals, editions) as the durable means through which we put our best ideas before colleagues and the wider musical public in durable form. But as digital texts remake the world of scholarship as surely as YouTube and Spotify have remade the curatorial function of the recording industry, critical authority and responsibility are changing, too. Editions prepared with open-source standards like the Text Encoding Initiative and Music Encoding Initiative editions, for instance, can be shared across any computer system, and can preserve with remarkable detail almost any level of intervention in a text, and distinguish my vision of a text from yours. Linked Open Data standards permit the interoperation of giant arrays of digital projects, connecting information about places, people, institutions, and musical works in complex ontologies of semantic tags. These are inherently destabilizing forms: layered and collaborative. The tools of the trade are reshaping scholarly cultures, no less than artistic ones. New Modes of Reading and Writing. The advent of digital texts for music will open the medium will open the medium to new sorts of research questions make possible by the interaction of close and distant modes of reading. We will be forced to imagine new ways of searching in musical texts, new ways of citing them, and new ways of representing our findings. New Forms of Publication and New Scholarly Communities. These new modes of reading will engender new forms of publication. Here we might think not only of digital alongside print, but the creation of new multi-author works, and publication in which the same author might take part in various ways, as editor, annotator, analyst, and respondent. Old distinctions between scholarly and pedagogical publications will also be blurred, and in turn the line between research and teaching will be porous. Process and community building will matter as much as finished work. This in turn will have profound effects on the ways in which we evaluate and credential our work, with special impact on the younger scholars best prepared to participate in the digital domain. New Disciplinary Intersections. The AMS, IMS, and IAML will foster dialogue among the tools and methods of its constituent members in the craft and study of music. But modes of inquiry will be put in counterpoint with digital disciplines practiced elsewhere in the academy, and beyond, including branches of Literary Studies and Linguistics (topic modeling, studies of style and authenticity, and syntax), Cognition and Brain Science (with computationally intensive investigation of neural networks that might inform our understanding of listening, composition, and the history of style), and Informatics (through big data techniques like clustering, similarity networks, and machine learning systems). Music historians are uniquely poised to take a leadership role in all this. No one knows which of these predictions will hold up, but I for one will make a beeline to the next congress to see what will have been accomplished. 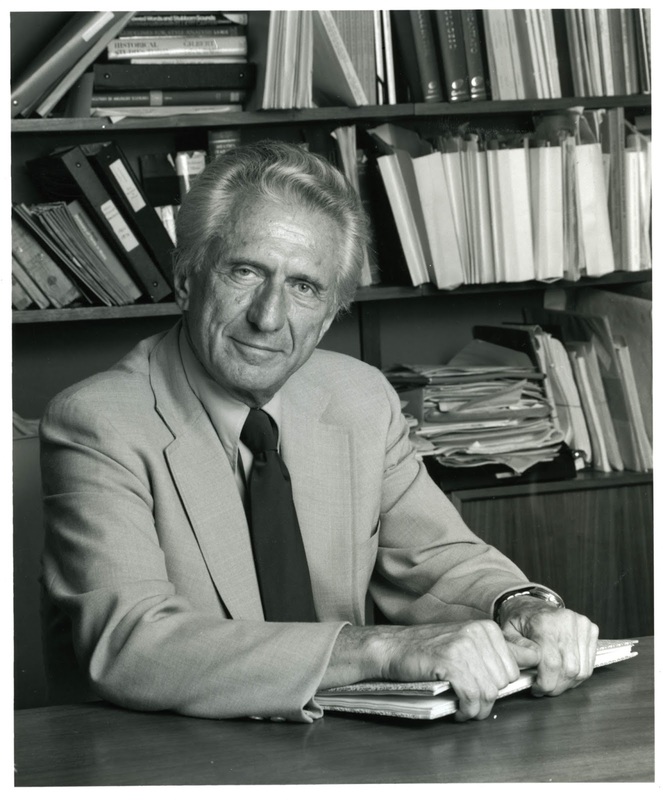 Richard Freedman is John C. Whitehead Professor of Music at Haverford College in Pennsylvania; webpage HERE. He is author of Music in the Renaissance in the W. W. Norton series Western Music in Context (2012). When not busy in the classroom or with research he enjoys giving public lectures on music, notably a series of pre-concert talks for the Philadelphia Orchestra and for the Philadelphia Chamber Music Society and work with One-Day-University (a traveling set of continuing education panels). More than Mozart, a set of 14 recorded talks for those curious to be better listeners, can be purchased through Barnes and Noble and Recorded Books. In 1918 the renowned St. Petersburg-trained violinist Toscha Seidel published a work for violin and piano titled “Eïli, Eïli.” The phrase “Traditional Yiddish Melody” appeared under the title, and the plaintive tune featured the augmented seconds and alternating duple and triple rhythms long associated with eastern European Jewish song. When Seidel performed the work at Carnegie Hall that same year, the critic for the New York Times identified the piece as “his own arrangement of the Hebrew prayer ‘Eili Eili.’” The violinist Mischa Elman, who like Seidel was a former pupil in the St. Petersburg Conservatory studio of Leopold Auer, published a new adaptation “Eili, Eili” in 1922, in a score that described the music as “A Traditional Jewish Melody” (LISTEN). During the 1910s and 1920s, “Eili, Eili” was performed and recorded repeatedly by violinists as well as vocalists, who sang the melody’s original Hebrew text, an adaptation of Psalm 22, verse 2, which begins, “My God, my God, why hast Thou forsaken me?” This text and melody were also the subject of ethnographic collection, included in 1910 and 1917 in published anthologies of Jewish religious and folk songs. In live performances and on records produced by major labels, noted cantors including Yossele Rosenblatt intoned the melancholy song. It was later reported: “When Yossele Rosenblatt chanted ‘Eili, Eili,’ angels in heaven seemed to sing along with him” (LISTEN). How, then, did this cherished Jewish folksong find itself at the center of a heated copyright infringement case brought by the Yiddish operetta composer Jacob Koppel Sandler against the music publisher Joseph P. Katz, argued before the Honorable John C. Knox, in a New York City federal courtroom in 1925? 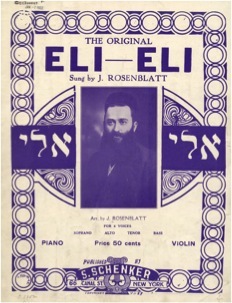 Sandler claimed that “Eili, Eili” was in fact an original composition he had written in 1896 for a production of M. Horowitz’s Yiddish operetta The Hero and Brocha, or the Jewish King of Poland for a Night, directed by the Yiddish theater impresario Boris Thomashefsky at the Windsor Theatre in New York. 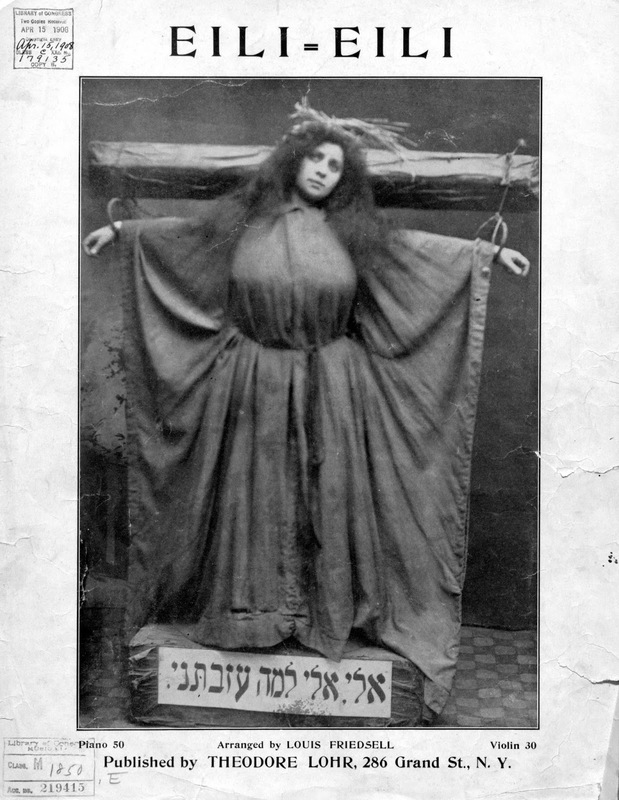 He had composed the number for the actress Sophie Karp to sing as she hung from a crucifix, enacting a young woman’s medieval martyrdom for refusing to repudiate her Jewish faith. Sandler only attempted to copyright “Eili, Eili” in 1919, however, after learning that it had become an international success, and he was suing Katz for violating his copyright by continuing to publish arrangements of the music. Katz testified that he had no knowledge that the melody was by Sandler; to the contrary, his father, an immigrant from eastern Europe, had hummed it to him decades earlier, and he had assumed it was a folksong. 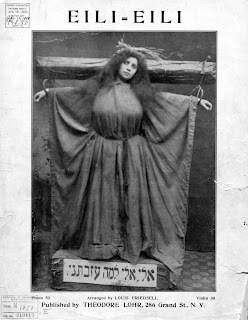 At trial, the prominent musician and author Lazare Saminsky recounted that he first heard the song in St. Petersburg and had “concluded that the composition was a folksong,” following which it was published in “a Russian encyclopedia.” At the same time, however, it was established by Yiddish theater participants testifying for the plaintiff that a number of musicians who had played in the orchestra for The Hero and Brocha had returned to Russia in the intervening years. Perhaps it was through them that the melody became known there. Abraham I. Menin, counsel for the defendant … took his violin and with the score of “Eili, Eili,” propped against a pile of law books, played the Jewish lament. The notes reached the corridors and attracted a crowd. An attendant closed and locked the doors of the courtroom and there was a silence until the music ceased. A tendency to applaud was checked by Judge Knox. Judge Knox ultimately decided in favor of the defendant, the publisher Katz, on a technicality of copyright law: too much time had elapsed between the alleged composition of the tune and the filing of the lawsuit. In response to the verdict, Sandler lamented, “What I feel is—is like a father that’s told he can’t have his own child.” Judge Knox later wrote in his memoir that he felt sorry for Sandler: “It is probable … that Sandler … really wrote it, but I did not have to decide the matter. The injunction was asked for on the basis of Sandler’s copyright.” By the time Sandler applied for copyright, the music had entered public domain, in legal terms; in the terms used by musicians who arranged and performed it, the music had become a folksong, as its origins were rapidly forgotten and its melody became increasingly familiar. My book Sounding Authentic: The Rural Miniature and Musical Modernism takes the curious story of “Eili, Eili” as a point of departure from which to examine a genre of arrangements of folk music and original “folk-like” pieces for solo or small ensemble that I call the “rural miniature.” Works in the genre, such as Elman’s and Seidel’s versions of “Eili, Eili,” Manuel de Falla and Paul Kochanski’s Suite populaire espagnole, Joseph Achron’s “Hebrew Melody,” and Béla Bartók’s Romanian Folk Dances, were played frequently in recitals in the early twentieth century, and many have persisted to this day as canonic “encore” pieces and pedagogical exercises for students of violin, cello, piano, and other instruments. They can be difficult to master, incorporating flashy, virtuosic techniques. The composition of rural miniatures in the early twentieth century emerged from the synthesis of contemporary developments in methodologies of folksong collecting, evolving ideologies of political nationalism, and the rapid emergence of sound recording technologies. In Sounding Authentic, the rural miniature provides the basis for a study of the search for authenticity that preoccupied so many musicians during the modernist period—including those who wrote, performed, and listened to the various versions of “Eili, Eili”—in their exploration of folk music and their incorporation of new ethnographic findings into the composition and performance of art music. Joshua Walden is on the Faculty of Musicology at the Peabody Institute of the Johns Hopkins University (webpage HERE). He is the author of Sounding Authentic: The Rural Miniature and Musical Modernism (Oxford UP, 2014) and editor of The Cambridge Companion to Jewish Music (Cambridge UP, forthcoming in December) and Representation in Western Music (Cambridge UP, 2013). NOTE: Professor Drott’s “Rereading Jacques Attali's Bruits” appears in the current issue of Critical Inquiry (41/4 [Summer, 2015]: 721-56. Few books have had as significant an impact on music and sound studies in the past thirty years as Jacques Attali’s Noise. Musicologists, ethnomusicologists, scholars of popular music, media theorists, sound studies scholars, cultural theorists, and countless others have drawn inspiration from Attali’s call for music and noise to be resituated from the margins to the center of social life. But there is something curious about the impact Attali’s book has had on Anglo-American scholarship. This point was driven home to me a few years back, when I was having a drink one night with a French colleague, Jedediah Sklower, in a café in the Belleville district of Paris. When the subject of Attali’s book came up, Jedediah expressed incredulity at the enthusiasm with which the book had been embraced outside France. What, he wondered, could possibly explain the enormous influence that Noise has exercised abroad? I’ve long shared Jedediah’s perplexity regarding the distance separating the status Attali’s work enjoys in Anglo-American academia and that which it is accorded in France. It was this perplexity that led me to write the critical reassessment of Noise and its legacy that appears in the summer 2015 issue of Critical Inquiry. To make sense of this riddle required an unpacking of the book’s political and ideological commitments, situating them in the context of debates taking place within the French left at the time of its publication. And of all the commitments that needed unpacking, the most significant was Attali’s anti-materialism, his inversion of the classic Marxian model that holds ideas, beliefs, and culture—including music—to be subordinate to economic relations. Famously, for Attali, music has a leg up on the economy, to the point that it is possible to hear in its sonic patterns presentiments of future social orders. Furthermore, the engine driving this forward movement of history is the noise referenced by the book’s title, which in politics as well as music represents a force whose disturbance of a prevailing socio-musical order lays the foundations for the one that will succeed it. What is revealed by a reconstruction of the sociohistoric context to which Noise responded is that Attali's assertion that music is "ahead of society" was less a hypothesis to be tested and perhaps verified, than a stake in a political struggle whose outcome would have enormous consequences for the future of France. Also revealed is the extent to which our embrace of Attali's theses has involved a misreading of the politics that animated them. To be sure, this has proven to be a productive misreading. But it is one whose disclosure raises questions we can no longer afford to ignore. What kind of ideological work do we perform in adopting for our own purposes Attali's anti-materialist theses, no matter how comforting a picture they paint of music's social significance? And to what extent can noise still be said to possess the disruptive potential Attali ascribes to it in an age when the greatest force for disruption is the reigning market system itself? Eric Drott is Associate Professor of Music Theory at the University of Texas, Austin, where he is head of the Division of Theory/Composition. His research focuses on contemporary music culture, avant-garde movements in music, French cultural politics, and the sociology of music. His Music and the Elusive Revolution (University of California Press, 2011) examines music and politics in France after May ’68, in particular how different music communities (jazz, rock, contemporary music) responded to the upheavals of the period. <1> Frédéric Lordon, “Avec Thomas Piketty, pas de danger pour le capital au XXIe siècle,” Le Monde Diplomatique (April 2015), pp. 19–20. Another anecdotal piece of evidence testifying to the animosity Attali’s work is capable of generating occurred last Thursday at a study day I attended at the Bibliotheque Nationale de France. At one point during a round-table discussion on the history of independent record labels in France, an invited speaker described Noise as “the stupidest book on music” ever written (“le livre le plus con sur la musique”). Judging from the response this remark garnered among attendees, he is not alone in feeling this way. After suffering through an endless string of jazz concerts ruined by overly aggressive sound men, I gave up entirely on live jazz and am spending the last part of my life going to classical concerts in Massachusetts, anything from Blue Heron’s Ockeghem to the Tanglewood Festival of Contemporary Music. Most often, I go to the New England Conservatory, where the professional and student music-making is routinely off the charts, ridiculous in the best sense of the word: Alisa Weilerstein giving a free concert with her parents, who are on the faculty; the BSO’s John Ferrillo as guest oboist in a historical performance of a Bach cantata that was one of the greatest musical experiences of my life; the NEC Philharmonia in Jordan Hall more or less outdoing the BSO at Tanglewood in their rendition of Brahms’s German Requiem. Last month (May), 19-year-old violinist In Mo Yang was still a member of an NEC student string quartet, despite having taken first prize at the Paganini competition in March. I marvel at all this stuff, and time and again I think, Gunther Schuller did this. He took a floundering institution and as its president (1967–77) turned it into a musical powerhouse. 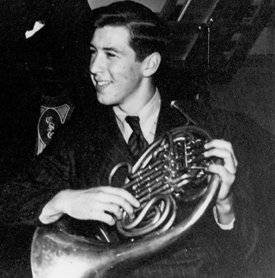 Born into a musical family in New York, Gunther Schuller was a prodigy on French horn. He first played with the New York Philharmonic at age 16. He was never important as a jazz instrumentalist—his claim to fame in that area was as a member of the brass section on Miles Davis’s historic “Birth of the Cool” tracks—but he loved jazz, he became deeply immersed in the scene, and he made pioneering contributions as an educator and musicologist, bringing the breadth of his talent and discipline to bear upon this newly evolving field. In the late 1950s, after having taken Aaron Copland’s place on the composition staff at Tanglewood, Schuller founded the Lenox School of Jazz, a short-lived shadow jazz parallel to Tanglewood. He brought in many of the leading lights of jazz to teach jazz history, composition, and arranging in the Berkshires, and from the West Coast he brought in a little-known student who would turn everyone’s head around: Ornette Coleman. In 1968 he published Early Jazz. Schuller believed passionately that the only way to write about a jazz artist was to listen first to every single available recording. This idea would become unwieldy for eras in which jazz recordings proliferated, but for Early Jazz it worked great. The book is filled with unprecedented insights. Schuller singlehandedly established the idea that jazz might be a topic for serious musicological investigation. In 1971, through Vera Lawrence and William Russell, Schuller tracked down a copy of the Red Back Book, orchestrated versions of ragtime tunes. The following year he founded what would become the tremendously successful New England Ragtime Ensemble, which over the course of 25 years would provide professional careers for a cluster of those fabulous NEC students. So when Marvin Hamlisch got all the musical credit for The Sting and the worldwide popularization of ragtime, Schuller was not pleased. We never met, except for one day in 1967 when he came over to our high school from San Francisco State College, to conduct his Meditation for concert band, and I feel unqualified to discuss his involvement in the avant-garde versus neo-classical wars. So I’ll break off here, and ask readers of this blog to celebrate other aspects of Gunther Schuller’s life and music. Leave a comment! A joint congress of the International Association of Music Libraries (IAML) and the International Musicological Society (IMS) is underway at the Juilliard School in New York City. It lasts just short of a full week, with a packed agenda. “Music Research in the Digital Age” not only focuses attention on the past, present, and future of digital musicology, but also evokes a long tradition of cooperation between the International Musicological Society and the International Association of Music Libraries, Archives, and Documentation Centers. 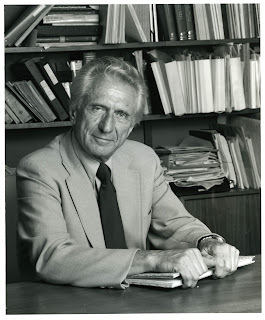 The Barry and Claire Brook Endowment of the American Musicological Society, established by their many admirers, supports research and publication in musical iconography. William Cheng, “Meritocracy's Darker Notes,” Huffington Post, 22 May 2015. William Cheng is Assistant Professor of Music at Dartmouth (website HERE), where is also a Public Voices Fellow. Additionally Cheng is a Junior Fellow at the Harvard Society of Fellow. His first book is titled Sound Play: Video Games and the Musical Imagination (Oxford UP, 2014; see blogpost of 21 September 2014), published with the support of the AMS 75 PAYS Endowment. Cheng's degrees are from Stanford (B.A., 2007) and Harvard (Ph.D., 2013). 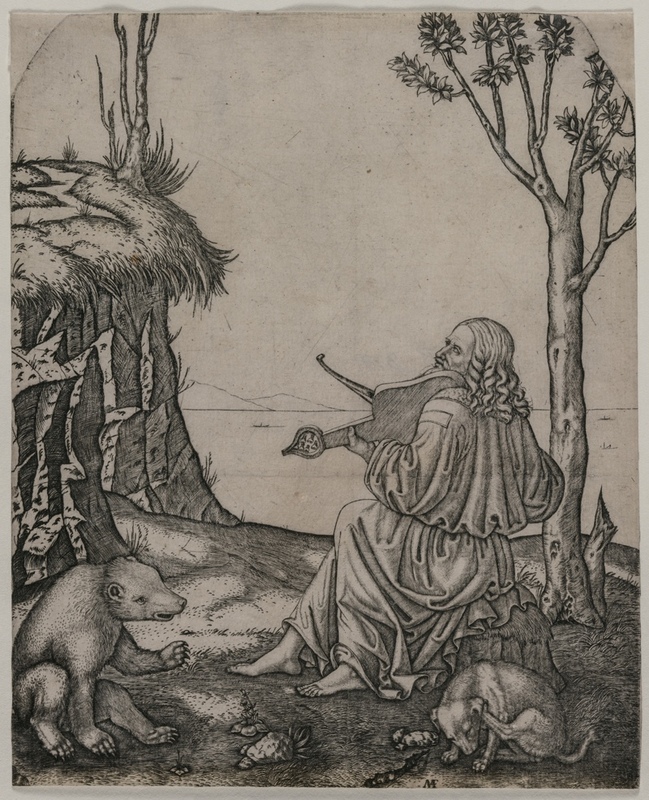 Professor Duffin's now widely reported essay suggesting the identity of the lira da braccio player in Marcantonio Raimondi’s Orpheus Charming the Animals appeared in the very handsome member magazine for the Cleveland Museum of Art, titled simply Cleveland Art (May–June 2015, p. 11). We give the text and one reproduction here, but check out the full PDF, of lavish presentation, HERE. When drawings curator Heather Lemonedes asked me to look at images and captions for the museum’s Themes and Variations: Musical Drawings and Prints exhibition, I was excited to do so. As a music historian, my task was to confirm that the musical subjects depicted were accurately described. Dealing with art from earlier historical periods is always a pleasure. Music historians have no physical artifact of our subject—only modern re-creations based on surmises about performance practice—and with visual art, we get to look at actual artistic creations from the same time as the music we study. Cleveland Museum of Art, 21.4 x 17.3 cm. It’s enough to make a musicologist envious! So, I’ve always reveled in opportunities to work on the connections between art and music, and teaching at Case Western Reserve University for several decades has given me easy and frequent access to the Cleveland Museum of Art’s unparalleled collection. Twenty-five years ago, for example, I published a catalogue of musical subjects in pre-1900 Western art at the museum,<1> so I knew the collection and its musical contents well—or thought I did. One of the works in the current exhibition is Marcantonio Raimondi’s Orpheus Charming the Animals, an engraving from around 1505. The draft caption described the instrument being played by Orpheus as a “lyre,” and that certainly made sense. There is even a novel by the Canadian author Robertson Davies entitled The Lyre of Orpheus, so to our modern sensibilities, the instrument and the name just seem to go together. During the Renaissance, however, the Italian term lira referred both to the harp-like instrument of classical antiquity (the lyre) and to a bowed string instrument about the size of the modern viola—the lira da braccio (“lira of the arm”).<2> The lira da braccio is often shown with a spade-shaped frontal pegdisc, rather than a pegbox with lateral pegs (like the violin or viola da gamba families). It also apparently had drone strings off the “bass” side of the fingerboard (a feature of the very few surviving instruments), though these drone strings are not always visible in works of art. Orfeo’s instrument in the Marcantonio print was clearly a lira da braccio, so I was happy to make the identification. When I wrote to Heather, I also mentioned that one of the most famous players of the lira da braccio in the Renaissance was Leonardo da Vinci (1452–1519), a detail that made it into her final caption. 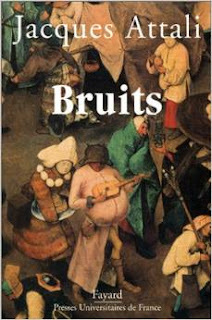 Interestingly, the last book published by Emanuel Winternitz (1898–1983), longtime curator of musical instruments at the Metropolitan Museum of Art, was Leonardo da Vinci as a Musician,<3> and there we discover that although Leonardo connected with music in myriad ways, there is no surviving record of any music that he played or com posed: nothing beyond the fact that he was a renowned virtuoso on the lira da braccio and loved to accompany himself as he sang improvised poetry. This information comes from Giorgio Vasari (1511–1574). Vasari was a mere seven years old when Leonardo died, and made his still-visible mark on Medici Florence with his painting and architecture, but his book, Le vite de’ più eccellenti pittori, scultori, e architettori (The Lives of the Most Excellent Painters, Sculptors, and Architects), is recognized as the very first attempt to document the history of art. Fu condotto a Milano con gran riputazione Lionardo a’l Duca . . . , il quale molto si dilettaua del suono della lira, perche sonasse: & Lionardo portò quello strumento, ch’egli aueua di sua mano fabricato d’argento gran parte, accioche l’armonia fosse con maggior tuba & piu sonora di voce. Laonde superò tutti i musici, che quiui erano concorsi a sonare. Oltra cio fu il migliore dicitore di rime al’ improuiso del tempo suo. With this as a background, I went to see the Themes and Variations exhibition and, facing the Marcantonio engraving in person for the first time, I had an epiphany. While examining the image earlier, I had been so concerned with properly identifying the instrument played by Orpheus that I failed to look at the player himself. It was Leonardo. It had to be Leonardo. Interest in the Orpheus legend of classical Greece had intensified in Europe after Poliziano turned the story into a proto-opera in Mantua around 1480, although no music survives from the first production or its planned revival a decade later (for which Leonardo’s pupil Atalante Migliorotti was to play the title role).5 One other phantom early production may date from 1506–7, at the home of Leonardo’s Milanese patron, Charles d’Amboise (French ambassador and governor of Milan),<6> and it has been suggested that some of the theatrical set drawings in the Codex Arundel relate to that production.<7> The lack of surviving music for these early versions of Orfeo notwithstanding, the image of Orpheus charming the beasts with the beauty of his playing became a popular subject for artists throughout the rest of the Renaissance. Often, Orpheus is shown playing the lira da braccio, or less often a lyre or even a lute, but one thing that is extremely consistent is that Orpheus is shown as a clean-shaven youth—the young husband of the tragic Euridice. In the Marcantonio print, however, Orpheus is a man in late middle age, with a beard and centrally parted hair with long curls. Around the time Marcantonio created the image, which dates to about 1505, Leonardo was in his early 50s. Only two contemporary portraits of Leonardo have survived: the famous red chalk self-portrait as an old man (Biblioteca Reale, Turin), and a second drawing by Francesco Melzi, who joined the 54-year-old Leonardo’s household as an assistant in 1506 and eventually became his principal heir. Melzi’s portrait shows a man with a beard and long curls, and the very slight bump in his nose and the ridge above the brow are an excellent match for the long-haired, bearded Orpheus in the Marcantonio engraving. PRESS COVERAGE: Owen Jarus's piece for LiveScience, 2 June 2015, is being widely reblogged in the majors: Discovery Channel, Yahoo, NBC News, Fox News. Ross Duffin is Fynette H. Kulas Professor of Music at Case Western Reserve University in Cleveland (website HERE). His Shakespeare’s Songbook, a study of the vocal music in Shakespeare’s plays, was published by W. W. Norton in 2004 and received the inaugural Claude V. Palisca Award from the American Musicological Society in 2005; previously his edition of Dufay chansons was recognized with the 1980 Noah Greenberg Award from the AMS. <1> Ross W. Duffin, The Cleveland Museum of Art (Répertoire Internationale d’Iconographie Musicale: Inventory of Musical Iconography, no. 8) (New York: Research Center for Musical Iconography, 1991). <2> For an overview of the instrument, its history and technique, see Sterling Scott Jones, The Lira da Braccio (Bloomington: Indiana University Press, 1995). On the lira da braccio in Renaissance depictions of Orpheus and Apollo, see Lisa Pon, “Further Musings on Raphael’s Parnassus,” in Imitation, Representation and Printing in the Italian Renaissance, ed. Roy Eriksen and Magne Malmanger (Pisa: Serra, 2009), 191–207. <4> Giorgio Vasari, Le vite de’ più eccellenti pittori, scultori, e architettori (Florence, 1550), part 3, p. 568. The 1568 edition (part 3, p. 5) adds a note about the instrument being in the shape of a horse’s skull (un teschio di cavallo), but as a later insertion it seems less credible. <5> On the early productions, see Elena Povoledo, “From Poliziano’s Orfeo to the Orphei tragoedia,” in Music and Theatre from Poliziano to Monteverdi, ed. Nino Pirrotta and Elena Povoledo, trans. Karen Eales (Cambridge: Cambridge University Press, 1982), 283–98. <7> British Library, Codex Arundel 263, fols. 224r and 231v. See Carlo Pedretti, “Dessins d’une scène, exécutés par Léonard de Vinci pour Charles d’Amboise (1506–1507),” in Le Lieu Théatral à la Renaissance, ed. J. Jacquot (Paris: Centre National de la Recherche Scientifique, 1964), 25–34. Carmen C. Bambach dates the Orfeo drawings to August 1507, so that may narrow the date for the production. See “Documented Chronology of Leonardo’s Life and Work,” in Leonardo da Vinci: Master Draftsman, ed. Carmen C. Bambach (New York: Metropolitan Museum of Art, 2003), 236. <8> If the two did meet, the Milan Orfeo production in 1506–7 seems logical as a terminus ante quem non, and this might suggest revising the date of the Marcantonio engraving slightly, and even positing that Leonardo himself portrayed Orpheus at that event, though the depiction may simply be symbolic. It also seems possible that the two met during one of Leonardo’s trips to Florence in 1509, though there is no documentary evidence for this. In fact, Marcantonio may have used a contemporary portrait of Leonardo for details of his features. seems to have been his own design. This may help to explain the original—almost whimsical—depiction of a revered contemporary artist/musician as a figure of legend. During the Cold War, thousands of musicians from the United States traveled the world under the sponsorship of the State Department's Cultural Presentations program. This program was not straightforward political propaganda, though it certainly supported U.S. government objectives. The musicians built relationships both musical and personal. By their presence and their performances, they also offered audiences evidence of America’s improving race relations, excellent musicianship, and generosity toward other peoples. 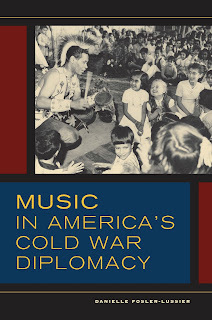 Some of their stories are detailed in Danielle's new book Music in America’s Cold War Diplomacy (University of California Press, 2015). The existing documents include evidence about how the American performances were received by listeners, including translated press clippings and eyewitness accounts. This evidence was gathered for the State Department by people who worked in U.S. embassies and consulates: inevitably, it was filtered through American perspectives. To make the picture more complete, we would need detailed archival and ethnographic studies conducted in the places where the musicians played. For this reason, it seems very important to help many other scholars discover portions of the data that relate to their own interests and expertise. Danielle began pursuing this research using the approach she knows best—piecing together musicians’ stories and details about how the Cultural Presentations program worked from fragmentary facts recorded in the documents. The book tells these stories. Yet one cannot tell all the stories: there are too many, and they are too heterogeneous. One can only choose and analyze some exemplary case studies. This approach is useful for understanding the phenomenon as a whole and some of its details, but not sufficient for fostering further research. For this purpose, Eric’s expertise in envisioning large amounts of data became critical. Together we have devised a database of cultural presentations—freely available online—that uses maps to make the musicians’ tours visible and offers information about archival sources pertaining to particular tours. Our foray into digital humanities has challenged us to think about our data in new ways. The raw data of individual performances, originally encoded in a spreadsheet, took on new meanings once we started to display information spatially. We began to be able to connect performing groups, countries, cities, and time, and could ask questions about where and how resources were deployed. Now, for example, we could see a list of all musicians and ensembles who traveled to South Korea across a few decades, and notice which cities received musicians multiple times over this period. A collaborative effort between musicologist and computer scientist was needed to think about what information researchers might want from the data, and how to display information about tours and individual performances in space and time. The development of the database interface required us to consider how to represent the data without distorting its historical context. Many former colonies gained independence during the period of time covered in the database: country names and boundaries were changing rapidly. How could we best present this historical data on the map, and how should users of the database be able to search for place names that have changed over time? In the end, we decided to organize the display according to current geography, but allow searching over all current and historical place names. A database offers the user the illusion of completeness—but historical data cannot truly be complete. The U.S. government keeps only a tiny fraction (about 5%) of the records it generates, and we have not had the resources to survey all the surviving records. Performer itineraries were frequently revised several times before they traveled—and then they often deviated from the plan again during their trips in ways that were never recorded. The limitations of the sources also informed our choices about how to display the data. We chose to display only the places of performance, and not the routes that could be inferred from the data, as the validity of those routes cannot be substantiated without further research. We hope this resource will be understood not as a complete record, but as a point of access that opens many kinds of inquiry to its users. If the database serves a springboard for further investigation, it will have done its job. Danielle Fosler-Lussier is Associate Professor of Music at The Ohio State University and the author of Music in America’s Cold War Diplomacy. She is grateful to the National Endowment for the Humanities, the Mershon Center for International Security Studies, and The Ohio State University College of Arts and Sciences for their support of this research. Publication of the book was also supported by the H. Earle Johnson Subvention of the Society for American Music and the Gustave Reese Endowment of the American Musicological Society. Eric Fosler-Lussier is Associate Professor of Computer Science and Engineering and Associate Professor, by courtesy, of Linguistics at The Ohio State University. His research investigates novel statistical methods for computer processing of speech and text.